If you know someone that loves Reese's Easter candy this is the perfect Easter Basket! Although we have many Easter baskets to choose from this is one of our most popular Easter baskets for kids and adults. 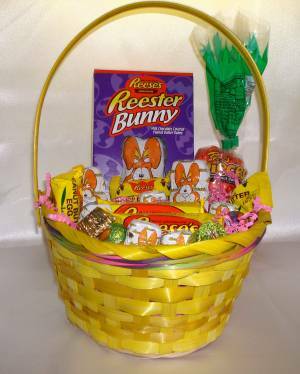 You get a great assortment of everyone's favorite Reese's Peanut butter eggs in a variety of different sizes along with Reese's Reester Bunnies. When it comes to chocolate and peanut butter candy it doesn't get any better then Reese's. This Easter basket is perfect for anyone especially the chocolate lover. Kids and adults enjoy receiving this Easter basket. If you prefer something a bit more geared for children we have many of Easter baskets for kids to choose from. All of our gift baskets are wrapped in a clear cellophane gift bag with a curly bow.